I’ve lost lots of things over the years, but there are three items in particular which really bother me: a set of thumb-sized dolls with bright blue and pink accessories I had when I was around three, a scrapbook of The ClioPlayers, a small theatre troupe I ran at URI in the early 1990s, and most recently, a rare Christmas ornament—Bernard from Disney’s The Rescuers. Every once in awhile, I think, one of these things’ll just show up in the most unexpected place—like a set of keys, an earring’s mate, or a favorite pen often does. But that never happens. They’ve just vanished, as though they’ve blinked out of existence. When I went to the Norman Mailer Writer’s Colony in Provincetown in January for a month, I’d brought a knit winter hat with me. I hadn’t owned it long and it wasn’t expensive—I’d bought it in late 2007 at Old Navy for $1.99—but it had become my favorite: since it was brown, it went with over half my wardrobe and both my winter coats, and in my opinion, it was stylish. It was also very warm. I wore it pretty much everywhere the whole time I was up there, but I didn’t need it the last week—the temperatures has risen to the high forties and even the low fifties, so it wasn’t necessary. When it came time for me to leave Ptown, I was packing my things and noticed it was missing. I looked everywhere. It wasn’t at Mailer’s house, nor was it at any of the bars, restaurants, galleries, or shops I’d been to. It wasn’t at any of my daily haunts, and it also wasn’t at any of the apartments I’d visited. I was able to figure out the last time I’d worn it was when I’d been crawling through a foundation on Commercial Street the day before my birthday, but I had a picture of me later that night with it on, so I knew I hadn’t left it in somebody’s sub-basement. It had simply disappeared. 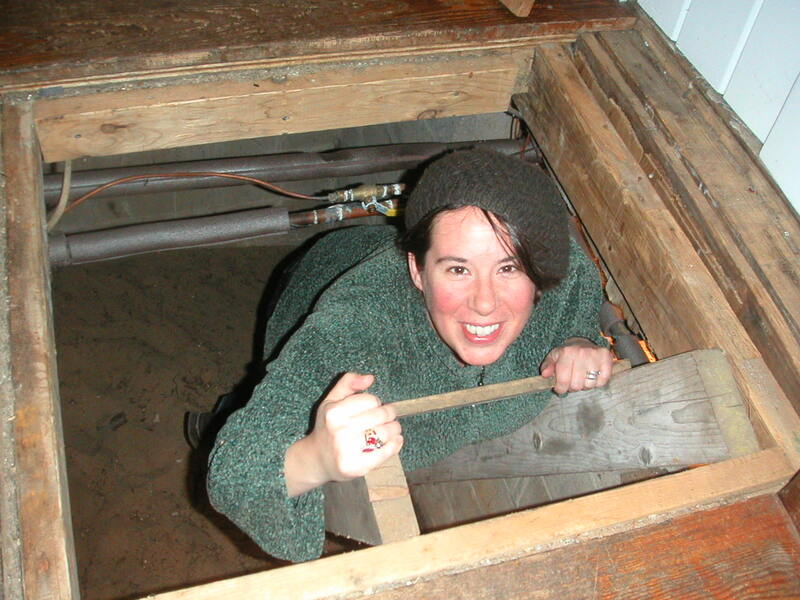 February 4, 2010: The last time I remember wearing my beloved brown hat; I was crawling around in house foundations. It was cold down there! I came back to Connecticut and shrugged it off, reverting to an older hat I didn’t like as much for the remainder of the winter. I had plenty of hats, so it wasn’t like I was going to purchase another one—nothing could replace the special brown one, anyway. The hat, however, hovered in the back of my mind like a love affair gone bad: what happened? Last week, I was back at the Colony as part of the Norman Mailer Center for a workshop. We met every day around a table in Norman’s living room, and had, as people do, adopted a “seat” for the week. I sat with my back to the sea, facing my new friend and fine writer, LuLu Johnson. She was making a poignant observation about someone’s work, but for some reason my gaze drifted beyond her right shoulder and settled in the corner. 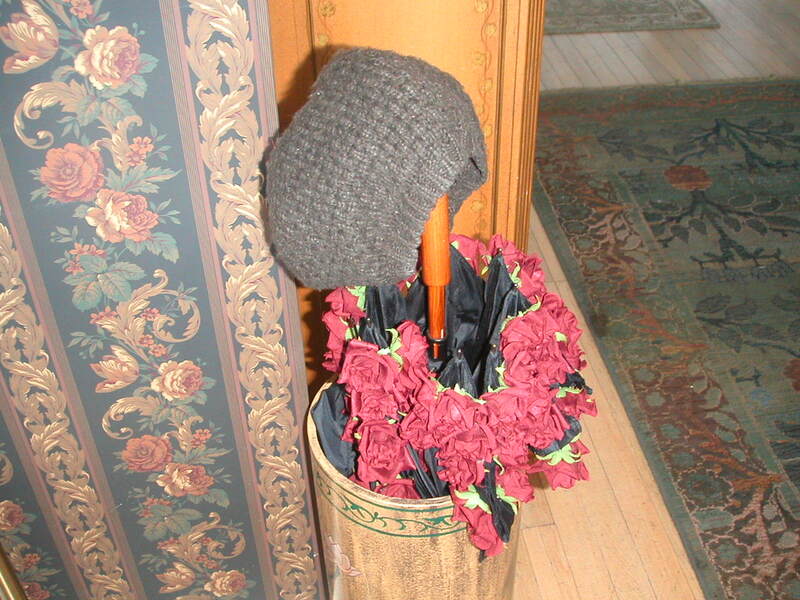 There, perched on a curved umbrella handle, was a brown hat. My first thought was oh my God is that it? It certainly looked like it—it was that milk chocolate color, it had the small basket weave, it was a little pilled all over and frayed on one edge. That can’t be it, I thought. That has to be someone else’s. But it was August, and who the hell would bring a hat like that to a beach community at the height of a record-hot summer? I blinked. It was still there. I studied it some more. August 12, 2010: This was pretty much the view over LuLu's shoulder. I was overwhelmed with the urge to leap out of my chair screaming, “my hat! I’ve found my hat!”—but I didn’t, knowing that not only would everyone not know what I was talking about, it would disrupt class. When workshop was over, I took a couple of photos and clutched it as I would a lost lover. It wasn’t until the next day when the group was having dinner at Pepe’s that I related my story. Marita Golden, our instructor, noted she was convinced objects have a secret inner life—that they need to go away for awhile sometimes, disappear completely, go on their own journeys. That they come back to us when we’re ready. Later that night, the hat was on my white coffee table. It looked so out of place it was eerie—the ghost of the winter when my own incredible journey had begun. I’d left Ptown in February in a state of confusion and unrest about my life, what I wanted from it, where I was going. At that time, doors weren’t just closing or opening—they were slamming or blowing off their hinges, and it had been so chaotic and emotional that none of it made any sense. August was the opposite. In the middle of the week—literally, on Wednesday—everything resolved. I knew where I belonged, what I wanted to do with my life, where I was headed. Doors were barely hishing closed and opening like their hinges had just been oiled, and what I’d been through in the last eight months seemed logical. Everything had come full circle. A journey had been completed. I was going home a settled, happy, optimistic person. In fact, I had so much optimism I could start blowing open doors all on my own. And the next day, the hat showed up out of nowhere. Weird. Coincidence? Maybe not. Marita might have been on to something. Do things disappear and materialize again when we’re ready? Is there some alternate dimension they haunt until the timing’s right? This is much like life. We can want things, we can try to force things to come about (or not), but in the end—and I believe it applies no matter what religion or spiritual orientation you are—these things don’t happen until we’re ready. Until the time is right. So what about my dolls, my scrapbook, my Christmas ornament? Perhaps they’ll still turn up. I could’ve begun a journey at the point where each of those items disappeared, and I’m not done yet. 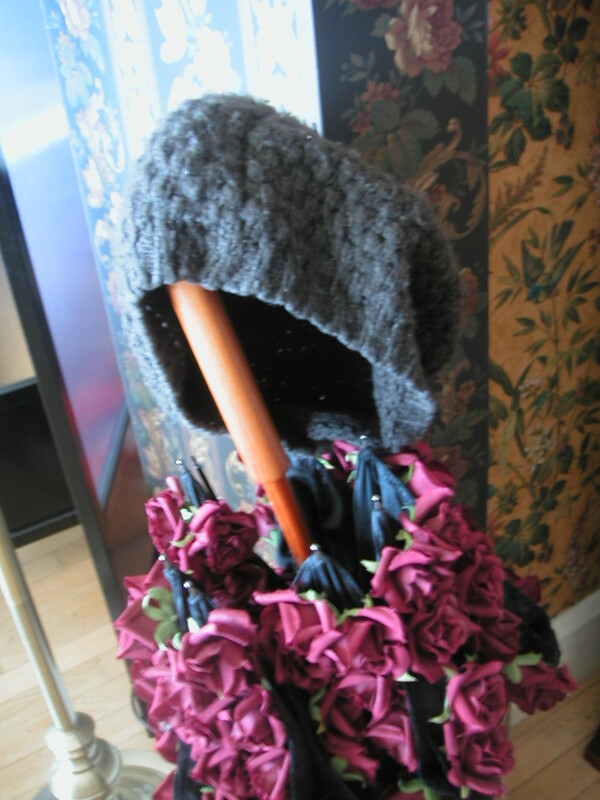 Posted on August 17, 2010, in Deep Thoughts & Fun Stuff and tagged Hats, Knit hats, Norman Mailer Writer's Colony, Winter hats. Bookmark the permalink. 4 Comments. Thanks, Gail! I just couldn’t believe that was the lost hat. I sure hope my towel turns up next time I’m up there…glad to hear all is well with you. School’s on, right? Here, too. I can’t believe summer’s over. It was a super-busy one…and I made the mistake of thinking I was going to catch a break in September. Not so! So much more to do! Yes school is on. Happy Friday. You are on fire lady. As I like to say to the kids-WRITE ON!!!!!!! Have an awesome day….